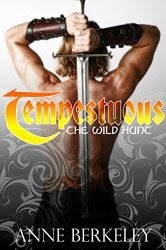 Tempestuous is a promising paranormal romance novel, with fascinating elements of Celtic folklore and Norse mythology. It follows Brynja "Bry" Teare, a young woman with extraordinary gifts and a troubled past, who conceals her abilities for years, while on the run. Bry's quest for self discovery leaves her with questions as to who she really is, and whom she can trust. She encounters a Viking highlander, Galinn Gunn, and begins to discover her own true heritage and divine fate. In the beginning, I had a hard time connecting to Bry, and in truth I found her too tough and emotionally disengaged. It wasn't until reading about her complicated upbringing, and the relationship with her father that I immediately understood her. It shaped who she was, and contributed to her inability to engage on an emotional level. It was especially evident in her interactions with Galinn. Their banter was amusing, as Galinn seemed to be in tune with Bry's inner conflicts. Conversely, I found their romance a bit lacking. I was far more interested in the mythology of the Norse warriors, the Celtic lore, and the riveting legends that surrounded them. I am a sucker for mythology, so I absolutely loved this aspect of the story. The minor issues didn't keep me from staying invested, or take away from my enjoyment of the story. Overall, it was an intriguing and well written tale.